In March, I spent two glorious days at the 32nd annual convention of the Wildflower Association of Michigan. Having worked with Ben VanderWeide, our township’s Natural Areas Stewardship Manager for four years, I’m still absorbing information on native plants at a ferocious pace. Like many of us, I’d never given much thought to the sources of plants surrounding my house. The lovely family that built our house no doubt thought of landscaping and gardening more as a decorative exercise than as a crucial way to establish beautiful and healthy habitat for insects, birds, and other wildlife. As a result, the small woods on one side of our property is full of non-native plants, shrubs and trees which do little or nothing to create habitat that supports wildlife. Luckily, the other side was left largely in native trees and our small slice of field carries an assortment of prairie plants and grasses. Dr. Doug Tallamy, author of Bringing Nature Home: How You can Sustain Wildlife with Native Plants, gave the keynote at this sold-out conference. He shared the science behind native plants in a completely engaging and easily understandable presentation. Dr. Tallamy and the other presenters opened my mind and put a hopeful smile on my face. Can our lawns and gardens really make a difference in preserving the natural world? Their answer was an emphatic “Yes!” And I’m already envisioning a transformation outside my front door! Why Bother with Native Plants, Anyway? 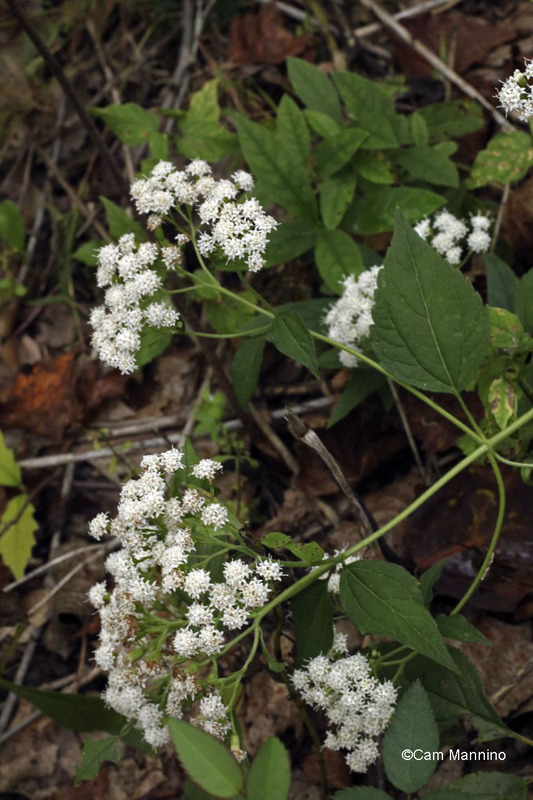 Native snakeroot that appeared when I began pulling non-native garlic mustard from our “green desert” woods. Dr. Tallamy began by pointing out that it isn’t really a matter of native vs. non-native. Plants from other parts of the world aren’t “bad,” but as Lois B. Robbins, author of Lawn Wars, puts it “A plant that is well-behaved in its hometown will often lose its inhibitions in another locale and trash the place.” Alien plants can be aggressive in a new environment, crowding out native plants since the restraints present in their native lands are not there to stop them. They can require more watering and fertilizing because they aren’t used to foreign soil. And as you’ll see below, they are not able to feed most of our wildlife. The value of native plants is that they are perfectly suited to their habitat; they have evolved over millions of years to survive in their home environment. As I discussed in an earlier blog, plants pass along the sun’s energy (and the earth’s nutrients and water) to all the creatures around them, humans included. Some are eaten both by us and by the other creatures in our local habitat. And some in each generation successfully reproduce, providing food for a next generation. But for that process to continue functioning, we specifically need… brace yourself… more insects! Is It Possible to Be Welcoming to Insects??? 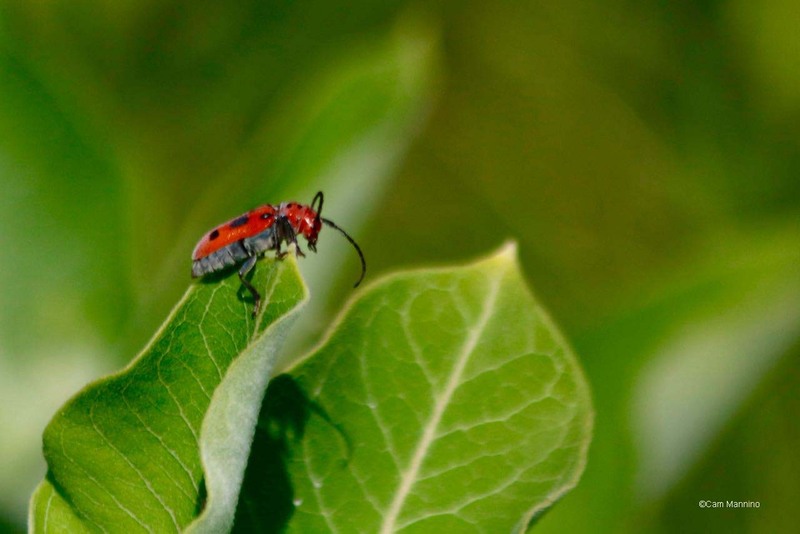 Red Milkweed Beetle (Tetraopes melanurus ) on a Common Milkweed leaf. We’ve all grown up in a world where insects are referred to as “pests” and routinely swatted, sprayed with deadly chemicals or fried in “bug zappers.” But the famous biologist E.O.Wilson calls them “The Little Things that Run the World.” Why? 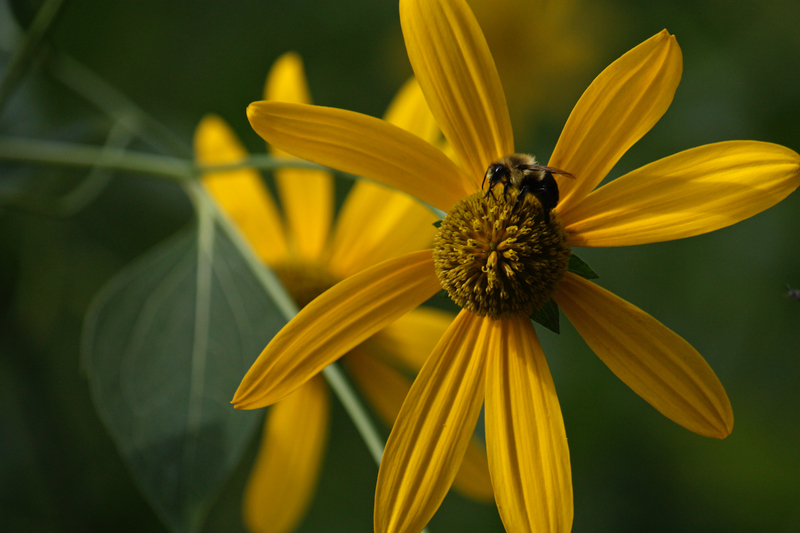 We first think of them as important for pollination, and they are. They pollinate 80% of all plants and 90% of all flowering plants. Without insects, most plants can’t reproduce. But there’s more to insects than pollination. Insects form the next ring out from plants in nature’s food web. They eat plants and when eaten themselves, they pass along the sun’s energy to fish, amphibians, reptiles, and of course, birds. According to Dr. Tallamy, insects and spiders “are essential dietary components for 96 percent of North American terrestrial bird species.” They eat them all year, even in winter, seeking out frozen or hibernating insects (or their eggs and larvae) for the protein they need to stay warm. They also need insects in order to raise their young in the spring and summer. Insect caterpillars are birds’ favorite food for offspring. Caterpillars, the larval stage of insects, pass along the most energy from plants to other animals. Bird feed them to their nestlings because they’re soft for tiny throats. Plus, they’re loaded with both fat and protein for little birds, and caterpillars are large. One fat caterpillar is easier for an adult bird to pluck up and ferry back to the nest than gathering up and delivering hundreds of tiny aphids, for instance. By the way, insects are 25% of a Red Fox’s diet and 23% of a bear’s. So mammals (including in many cultures, humans!) eat them as well. 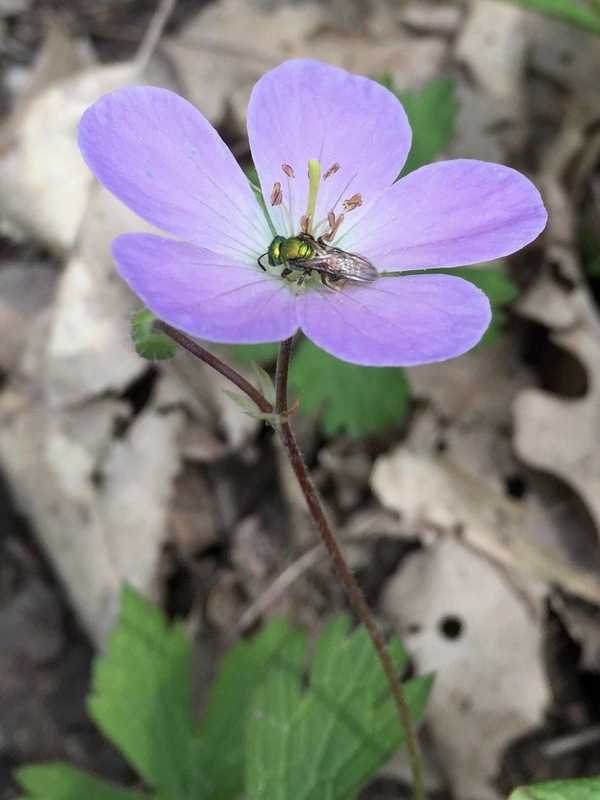 So, How Does the Importance of Insects Relate to Native Plants? It turns out that insects vastly prefer the plants with which they evolved. In fact, research shows that 90% of insects are specialists; they will only eat or lay their eggs on certain native plants. The Monarch Butterfly (Danaus plexippus) is, of course, an extreme example. 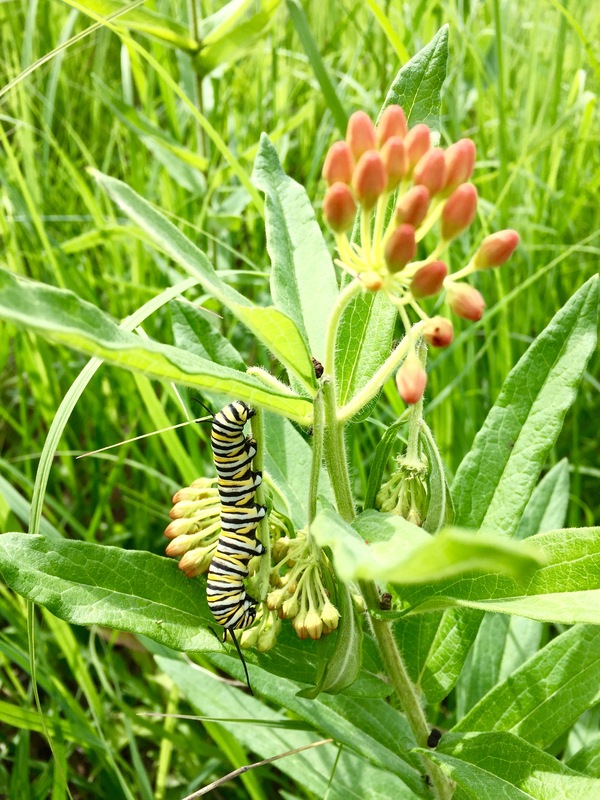 Out of the 2,137 genera of plants in North America, the Monarch’s caterpillar can eat exactly one – the milkweeds (genus Asclepias). The very reason butterflies and hundreds of thousands of birds go to the trouble of migrating north is the huge pulse of food produced each spring by our native plants and the insects that feed on them. Butterflies and other insects may lay their eggs on non-native leaves and stems if that’s all that is available, but once the caterpillars hatch, they often can’t eat them or can’t get enough nutrition to finish developing into reproductive adults. With fewer caterpillars, 90% of birds have less to eat – and on it goes throughout the food web. 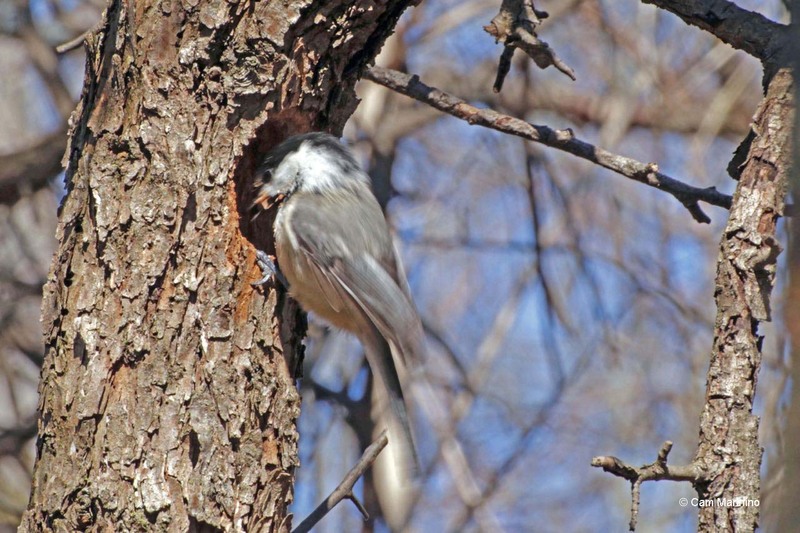 A Black-capped Chickadee (Poecile atricapillus) emerging from nest building with wood shavings on its beak. 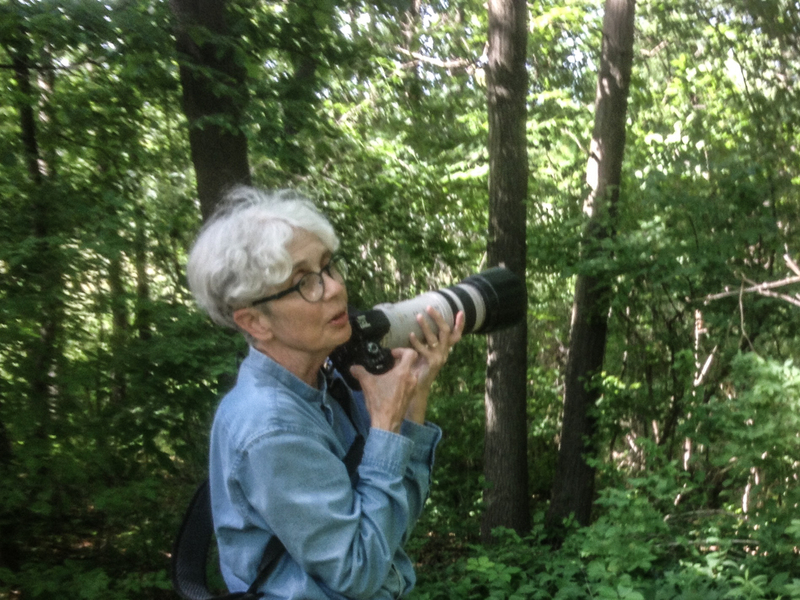 Dr. Tallamy shared the results of a study on Carolina Chickadees (Poecile carolinensis), which need 6,000 to 9,000 caterpillars in a season to rear one clutch of fledglings! His student, Desirée Narango, compared chickadee breeding success in home landscapes with native plants vs. landscapes filled with non-natives. Have a look in your yard this summer. At the end of the summer, if I bother to look, I’ll find many more signs of insect munching on the big, leafy Black Oaks (Quercus velutina) in our front yard, for instance, than I will on our non-native Japanese Maples (Acer palmatum) or invasive Black Locust trees (Robinia pseudoacacia). “No holes, no chewed leaves, no damage – sounds good to me!” you might be thinking. After all, that’s one reason that you and I have always liked non-native species and why nurseries like to sell them! If you want plants that are just decorative, that might work for you, but not for the nature around you. But step back a few paces and the chewed leaves of natives are hardly noticeable. I’m hoping my yard can be beautiful while also being more productive, filled with life and energy, more a working part of the natural world. Dr. Tallamy respectfully described some of the questions and challenges other scientists have raised about native plants and their importance. Here’s what his research and the research of others have shown that answered their concerns and maybe yours. But I’ve seen birds and butterflies feeding on non-native plants! Ten percent of insects are generalists who can eat a wide variety of plants, but even their populations are lower on non-native plants than on natives. Adult butterflies and other native insects can often sip nectar or spread pollen from non-native flowers, thereby helping them take over fields! But unfortunately their caterpillars cannot grow to adults by eating non-native plants. As a result, insects in landscapes with few native plants don’t reproduce effectively, their numbers decline, and the loss is felt throughout the food web. 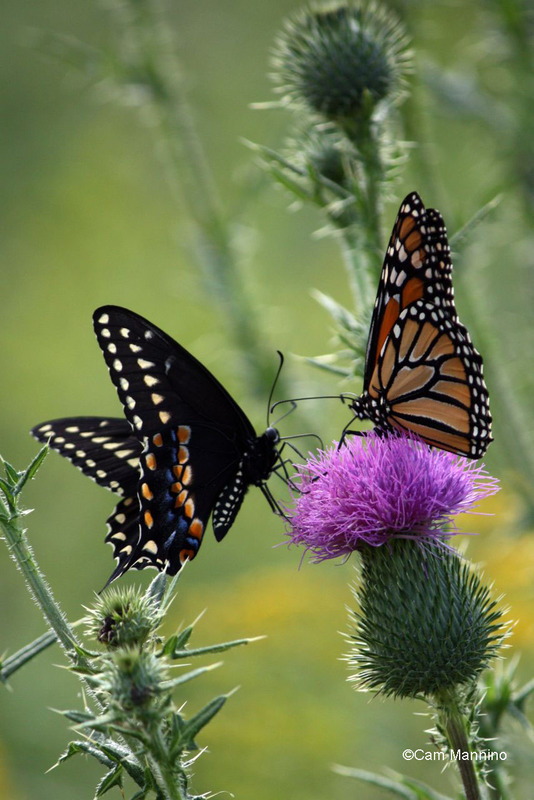 Both the swallowtail and Monarch can feed on non-native bull thistle, but their caterpillars can’t survive on their rough, spiky leaves and stems. Birds will also feed on non-native plants, but they often can’t get the nutrition they need. For example, our native plants produce berries in the summer that have low fat and high sugar content, which is great for fledgling birds. In the fall, native berries are high in protein which is just what migrating birds and birds that spend the winter require. Non-native berries in the fall and winter are very low in fat and high in sugar, which won’t sustain birds on migration or in cold weather. Isn’t this just some romantic notion about returning to an imagined pre-European settlement, pristine world – or even worse, a kind of horticultural prejudice against alien plants? Again, the issue isn’t good plants or bad plants. 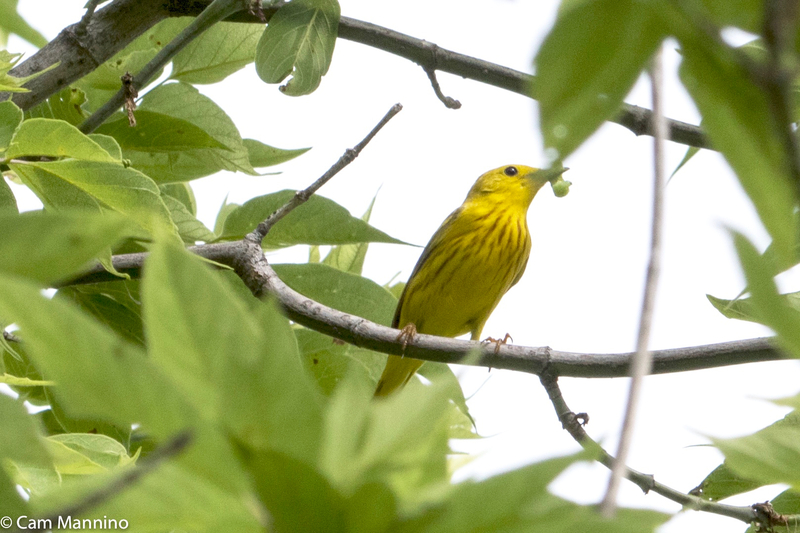 If we want to restore habitat, we need plants that feed our local food web, that provide insects for food, and that provide shelter and nest sites for birds and other local wildlife. Native plants are just much more efficient and productive at doing that than non-native plants. When does a non-native plant become native? How long does it have to be here? If non-natives acted in the food web like natives, we wouldn’t care how long it had been here. But they just don’t, because insects don’t adapt to new foods quickly. The invasive, non-native grass Phragmites (Phragmites australis subspecies australis) feeds 170 plant-eating insects in its native Europe. But it’s been in North America for 300 years and only feeds 5 insect species here. Eucalyptus trees (genus Eucalyptus) feed 48 species in their native Australia. They’ve been in North America for a 100 years and feed only one! How about planting cultivars of native trees bred for special colors or flowers, for example? In general, when nursery-developed cultivars of native trees are planted, caterpillar abundance drops 65%. Bees too are very particular about flower shape. When native flowers or trees are bred for double flowers instead of single ones, it can have a big impact on pollinators. Or if the leaf color is changed to red or purple instead of green, insect numbers drop. Changing to variegated leaves, changing height or berry size, however, may not be a problem. Many natural areas in our region (and yours too, probably) are heavily infested with aggressive non-native plants just like the woods on my property. That’s why our township stewardship program is always working to eliminate aggressive non-native plants and restore abandoned fields and forests to a healthy, diverse assortment of native plants. Many non-native plants have historically been promoted by nurseries and landscapers and then escaped into the wild. The seed of others arrived here in livestock feed or grazing grasses. Some of you older readers may remember moths dancing in the headlights when your parents drove the car at night. Some people affixed bug screens to the fronts of cars to prevent insects from smashing regularly into the grill, hood or windshield. But no more. Unfortunately, every generation thinks the number of insects around them is “normal” when it’s actually been steadily declining for decades. We usually think of insecticides first when we hear about the decline in bee, butterfly or other insect populations – and they do have a powerful effect. And climate change is no doubt taking a toll as well. But the fact is that we just don’t have enough natural areas full of native plants left on our planet to feed insects and hence other wildlife. Researchers estimate that half of the arable land on earth is now covered by agriculture or ranching. Corn and soy bean seeds, the most common agricultural plants in America these days, are often treated with insecticides which are designed to kill some insects. These plants are also wind-pollinated and so don’t provide nectar or pollen for insects.We have 770 million acres of rangeland in the US, an area 12 times larger than the state of Michigan! Ranchers are just now being encouraged to integrate native grasses after decades of growing largely non-native grasses. And our non-native lawns are actually the largest irrigated “crop” in the United States. Non-native plants hold the upper hand in most natural areas that are not managed carefully. Luckily, our township’s stewardship program here is restoring native habitat in our parks every day. Former farm fields choked with non-native shrubs and plants are being restored to diverse and beautiful prairies like the one above, full of the color and insect hum of native plant communities. And we can do the same on a smaller scale right out our front doors. Property owners – home owners, businesses or towns – are now our best hope for restoring native habitat for the benefit of wildlife and ultimately for ourselves as well. Currently, our yards are largely “green deserts” in the sense that they just don’t provide enough food, protection or nesting sites to support the food web and create healthy habitat for wildlife. At most American homes, like mine, the lawn is a stretch of non-native turf grass (the standard lawn grasses) and the gardens are still largely filled with non-native trees, bushes and flowers. Get a copy of Bringing Nature Home by Douglas W. Tallamy. The whole book is great. Chapters 8-12 are specifically targeted toward getting started with native plants in your lawn or garden. Look for native plants sales in your community. This year the Oakland Township Parks and Recreation Commission sponsored a sale, for instance (orders are already in for this year). I’m aware also of yearly native plants sales in our area: North Oakland Headwaters Land Conservancy hosts a sale in Clarkston, and Cranbrook sells plants rescued from developments. If you look, you’ll find some near you if you live further afield. Hidden Savanna Nursery near Kalamazoo grows Michigan native wildflowers, grasses, shrubs and trees sold in containers and plugs. Specializing in Southwest Michigan genotypes. They have several retail sale dates on weekends in spring and late summer. Wildtype in Mason, Michigan. Largely a wholesaler but have three weekends in May and one in August for those of us buying retail and in smaller quantities. The retail catalog has helpful information about each plant. Michigan Wildflower Farm near Portland, MI grows Michigan native wildflower and grass seed, and provides design, consultation, installation, and management. 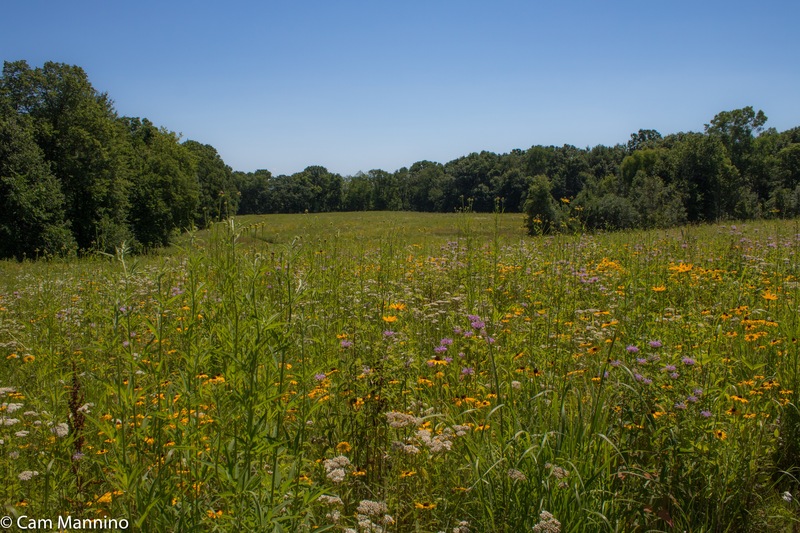 Native Connections near Three Rivers, MI grows Michigan genotype wildflower and grass seed, design, consultation, installation, and management. Go Grow Plant Natives near Charlotte, MI is a native plant nursery specializing in Michigan native shrubs, trees, and wildflowers. The Native Plant Nursery in Ann Arbor grows only local native plant species from Michigan seed sources and produces a diverse selection of native perennials and a few species of native trees and shrubs. Often has a booth at the Ann Arbor farmer’s market. She Is Growing Wild in Ada, MI grows and sells over 80 Michigan native species. 616.450.7407, sheisgrowingwild@gmail.com. DISCLAIMER: Oakland Township Parks & Recreation does not endorse or promote any business entity which produces or markets native plants or seeds, or which provides landscape design or installation services. The list of vendors is provided for informational purposes only. Information above is from the websites of the Michigan Native Plant Producers Association, River City WildOnes, and the Native Plant Guild. Links to websites included when available, otherwise phone numbers and email addresses. Beware of buying any plants or seeds treated with insecticides, specifically neonicitinoids, as they are harmful to insects despite what the label says about it being approved for human health. Also avoid seed mixes that say something very general like “prairie seeds.” You may get a glorious bloom the first year, but many of the plants are not local and could introduce invasive plants that you and your neighbors will battle later on. Many native plants don’t need or like fertilizers or other soil amendments. Some do better without them. Some will take off too enthusiastically and try to take over your garden. Learn a bit ahead of time about which ones re-seed avidly and which tend to stay put. Be prepared to pull some out if they get too rambunctious. Start small and consider the neighbors. Native gardens can function as an advertisement to your neighborhood of the benefits of native gardening. Keep the edges trimmed or even decoratively fenced for a tidy look. Plant informally or formally; native plants need communities of other plants, but that can include massing colors and other popular approaches to garden design. Create mowed paths through your yard if you decide to try a native lawn, which is a larger undertaking. You want a native lawn to look tended and purposeful, not neglected. Be patient. Remember that native prairie plants here in Michigan, for example, need deep roots to handle drought. It can take up to 3 years for your new plants to reach full bloom. Learn which plants work in your soil ahead of time but also be prepared to switch things out that don’t work, if necessary. Take it one step at a time and have fun!